Did you know that November is International Percussion Month? For those unaware, any instrument played by striking something with your hands or a stick is a percussion instrument. There are many percussion instruments in the world, but the most well-known is the drum. A drum can produce many sounds, and the sound it produces depends on the build of the drum, along with how hard it’s hit. Want to learn how to play the drums? Follow these instructions, and see how you can master the art of percussion. There are many types of drums in the world, but for now we will focus on playing a basic drum set. You can buy one at a local music store, or you can borrow one from friends if they are willing. Before you can start playing, you need to familiarize yourself with each part of the standard drum kit. The snare drum is the centerpiece of most drum kits, and it’s the drum that produces the loudest sounds. The largest drum offered in the kit is the bass drum, also known as the kick drum, which is played using a kick pedal that you push with your foot. This drum is primarily used to help you keep good timing, so you can play to the beat of a song. The rest of the kit consists of other drums and other pieces you use to produce other sounds, including various cymbals, floor or hanging toms, and the hi-hat. In addition to a drum kit, there are a few other items you should get. Unless you plan on standing while you play, you should buy a drum stool to sit on. You should also get a music stand to display the sheet music you are going to follow. To play the drums, you will need a properly sized drum stick that is comfortable to hold in your hands. It would also be a good idea to have a metronome, since it can be used to help you keep a steady tempo once you start practicing. Once you have these extra tools, you are ready to start playing. There are two techniques for holding the drumsticks while you play, the matched way and the traditional way. For matched, you hold each stick in your hands between the thumb and your index finger, while using your other fingers to support the stick. A similar stance is used for the traditional way, except you rest the stick between your ring finger and index finger for your left hand. The stance you use ultimately depends on your preference. Depending on the type of music you are playing, one stance may be preferred over the other. Now it’s time to start playing. First, you must learn about rudiments, the fundamental patterns of drumming. One such pattern is the Single Stroke Roll, which involves alternating strikes from left to right. There are other patterns to practice, and they will help you learn how to keep a good tempo. After you practice, select the type of music you want to perform. Following this, you need to learn about fills, which are musical passages designed to keep an audience’s attention during breaks in a song’s melody. When you read through the sheet music, you will notice these breaks. Pay attention so you know when they come up if you plan to play with others. 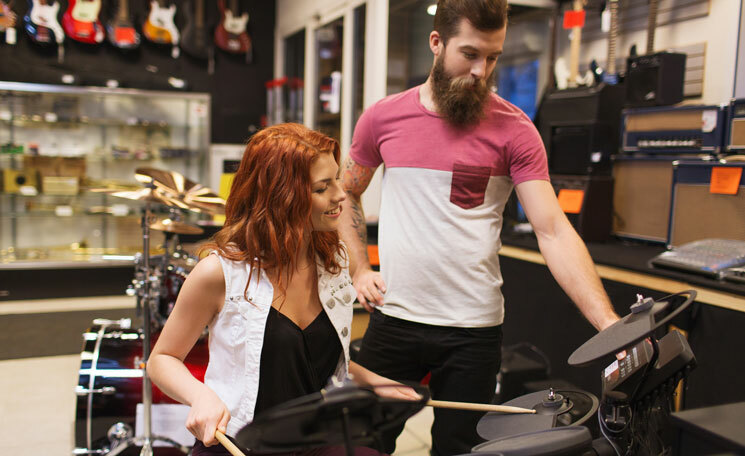 Continue practicing basic beats until you get a feel for how your drum set works. Once you get a feel for the rhythm of playing the drums, you can start playing off sheet music. Being able to read sheet music is a necessity if you plan on playing in a professional music group. Music sheets will have specific drum notations that will indicate when the drummer needs to play. Each drum and cymbal has its own note or shape on a music sheet. The note’s shape and placement indicate which drum you need to hit at that point in time. For example, bass drum hits are indicated by the note F on the musical staff or stave (a dot on the very bottom row). Cymbals are indicated with an X. The placement of each note lines up with the placement of the drum in your kit, so by memorizing how your drum kit is set up it will be easier to memorize the notes. Download exercises off the Internet to get a feel for how to play these notes in a rhythm. If you ever struggle while playing, don’t be afraid to ask for help. Either ask a friend who already knows how to play, or hire a tutor. Mastering a musical instrument takes time, so if you don’t pick it up right away, don’t get frustrated. Simply take a break, look up some tips online, and come back later with renewed confidence. Lastly, don’t forget to use your metronome while you play; it’s an important tool for keeping a good tempo. Practice makes perfect, so the more you play the drums, the better you will become.